situations, and that is exactly how I feel." Singer Ross Baker , 26, was staying with friends he met while traveling on the island of Koh Phi Phi, Thailand, when the tsunami hit. He was due to meet a friend in Bangkok on 28 December but never arrived. 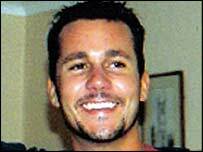 His cousin Jodie and brother Peter are traveling to Thailand in a desperate attempt to find him. His father Steve Baker, from South Brent, Devon, said: "People say that they feel numb in these situations, and that is exactly how I feel. You are totally impotent." Mr. Baker was taking a break from his part in a touring production of the hit musical Fame.